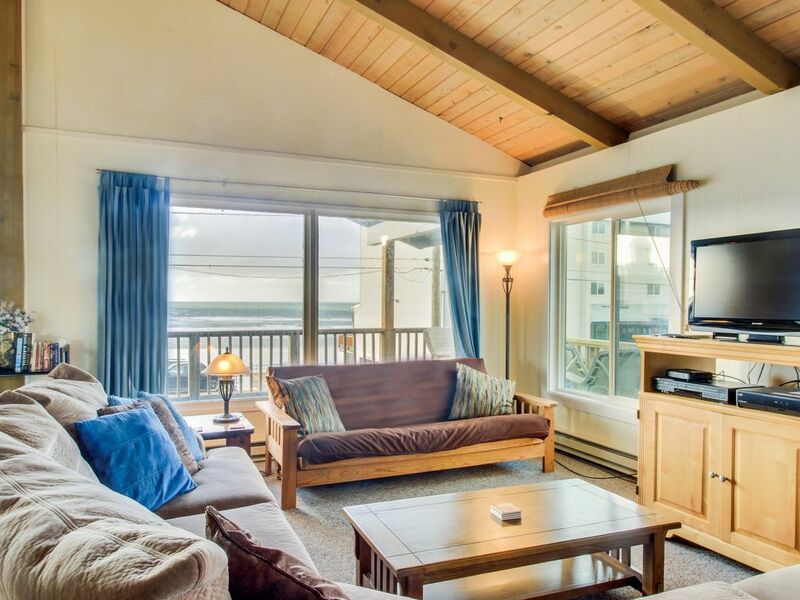 Dog-friendly oceanview duplex with beach access, walk to Nye Beach shops & more! Steps away from the picturesque shores of the Oregon Coast, this dog-friendly Newport escape gives you a place to unwind in peace and beauty. Comprised of two separate living spaces that can be rented separately, room for up to 12 guests, and a central location near a variety of activities, you won't have to go far for fun. Two dogs are also welcome and allowed only in the lower level of the home. Just steps away from the picturesque Oregon Coast (beach access is right across the street! ), six blocks from the lush nature preserve at Yaquina State Park, and just a short walk from the shops at Nye Beach, you'll have everything you need at your fingertips. Each half of this duplex can also be rented individually - there is one self-contained home on the upper floor and another on the lower level. This listing is for both sections of the home, allowing for everyone to stay with privacy and plenty of room. Both sections have their own kitchen, full bathroom, and either a patio or balcony. Light pouring in from the oceanview windows highlights the wood beamed ceilings in the main living area on the upper floor. Surf the cable channels, or watch your favorite DVD on the flatscreen HDTV. Check the scores of all the games when you connect to the in-house free WiFi. Bask in the ocean views from your private balcony with a glass of refreshing wine. Fire up the charcoal BBQ and grill up a delicious dish for everyone to enjoy. If grilling isn't your thing, head back inside and put the upgraded kitchen to good use. The granite counters and stainless steel appliances will make cooking a for your group a breeze. You won't have to worry about clean up with the convenience of a dishwasher, so you can get back to the board games with your guests. This four-bedroom, two-bathroom duplex has room for up 12 guests. Each room has a queen-size bed letting everyone stay in comfort. If you need more sleeping options there are two fold-out futons available. Dogs are also welcome to come along for an additional nightly pet fee. With Yaquina State Park right down the street, and a bevy of fun shopping choices just down the street, you'll be able to leave the car at home. Wander down the sandy shores or meander through the shops, then make the quick drive to to the Agate Beach Golf Course for a round of golf. On your way back stop at the Rogue Ales Brewery for a decadent menu everyone will love. Fill your next seaside getaway with relaxation and stunning views when you book your stay at this Oregon Coast home. Parking Notes: There is parking available on the side of the duplex as well as in front. Water Access: Beach access is directly across the street -- there is a staircase leading to the beach. nice to stay, this is my second time stay here. The location was great! A few updates here and there would make this place amazing. We had a great time. Nice, clean with all the basics. We'll try to stay in the same place again. This house was very clean, spacious, and had a beautiful ocean view. The house had a nice living room area with board games and movies to watch during the rainy beach nights. The only bad thing I could say about it was the WiFi was a little slow but other than that it was a great overall experience! Upper retreat was nice, don't bother with the lower one. Clean, comfortable, watched whales from living room window. Downstairs is a separate apartment, good for a group that have varied sleep schedules.